Overall goal: Strengthening the livelihoods of vulnerable households in 4 provinces. Continue developing the associative functioning and strengthening the membership basis and clear internal policy of CFAP Cambodia and to assure that all regulations must be respected,. Diversifying income generation, food entitlements and minimize the hunger gap period of rural farmers. Establishment of one provincial farmers’ market to ensure the sustainable producing activities of farmers. Have better access with good quality farmer’s products to market for sale with better prices. Strengthening the quality of farmers’ products toward markets demands. Organizational strengthening (staff capacity building), improving the institutional linkages and organizational/professional skills of staff and Board members. Capacity building of existing producer groups being member of CFAP Cambodia (common understanding of 7905 members about associative functioning principles). Members and their relatives will have improved their agric. 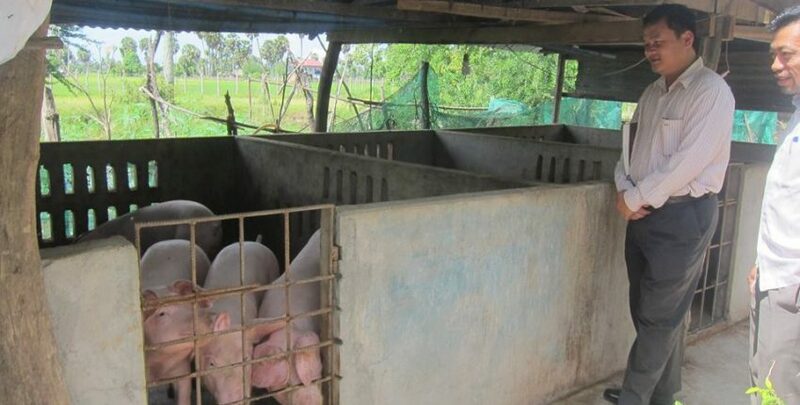 Production systems and an increased income (vegetables, poultry farming, fingerlings, improved pig production, improved saving activities and credit system initiated. Members will understand the concepts of marketing and price assessment better to increase their producing activities for market demand and hh income. The total indirect and direct member (39,525 persons) will have increased their productivity in agricultural production from less than $1 per day to $1 or $1.50 per day. It will be 70% expected income from the project. Increase agricultural output and income generation through training to improve appropriate agricultural skills; livestock and aquaculture practices, and non-agricultural skills; organic making, initiatives toward market access, leadership and financial management especially the support and sustaining to the women empowerment in agro-enterprises, small handicraft activities in the villages, and protection of village migration and leaving from agriculture of young generation in the future. Seeking for support on creation a provincial cooperative market for sale/ purchase and circulation of farmers’ products from donor agencies. The training of roles and responsibilities of VFAs, VWAs, CFAs and or CBOs leaders. Seeking for loan with low interest to provide the members, supporting small scale agro-enterprises and handicraft activities at the operational areas. study tours (inside and outside of the countries) for staff, board and farmer leaders in order to gather new experiences/ knowledge and ideas to use in their respective community /organization. M&E: CFAP Cambodia has developed a log-frame with measurable indicators, including quantitative as well as qualitative indicators. As the financial contribution of CFAP Cambodia is limited and CFAP has not yet developed plans for self financing, the sustainability of CFAP Cambodia as such is doubtful, without external financial support. The producer organisations will pay a nominal membership fee to CFAP Cambodia. If CFAP succeeds on supporting its members to attract micro credit for producer groups, there is a chance of developing into sustainable producer groups. However, this process will take time.